The Denomination Standard (as opposed to the 'gold standard'): regularity in currency through time and place. A unit of gold is said to (give and take a little) buy the same good through time - hence the gold standard. My hypothesis is: does the denomination 'size' of fiat money (currency) buy the same goods (opposed to the nominal size which will differ from time to time, place to place). How many of the lowest paper notes does it take to buy 'x' good - my case a big mac. I have found that in the developed world it costs generally around 2 of the lowest denomination notes for a McDonald's Big Mac (2012). Of course the amount grows the less developed the country - Sri Lanka 29. I conclude there maybe a 'standard note' (thank you to my student Paul) that will stand like a 'standing wave' over time and place; nominal prices will flow (rise) through it. Difficult to find a standard good, and there are lag times of course as note stay in circulation for some time in stable economies. 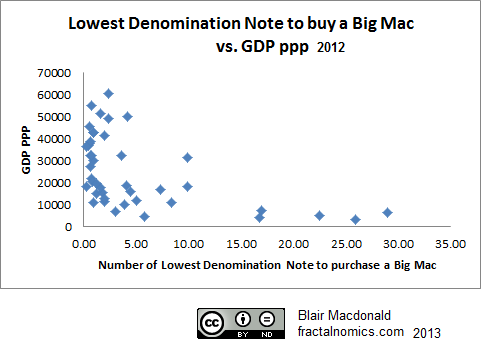 I will soon publish a table of my Big Mac standard note. Inflation through time - and the standard note. The test will be: does the standard note hold through time with inflation? My survey of the US dollar says not exactly. 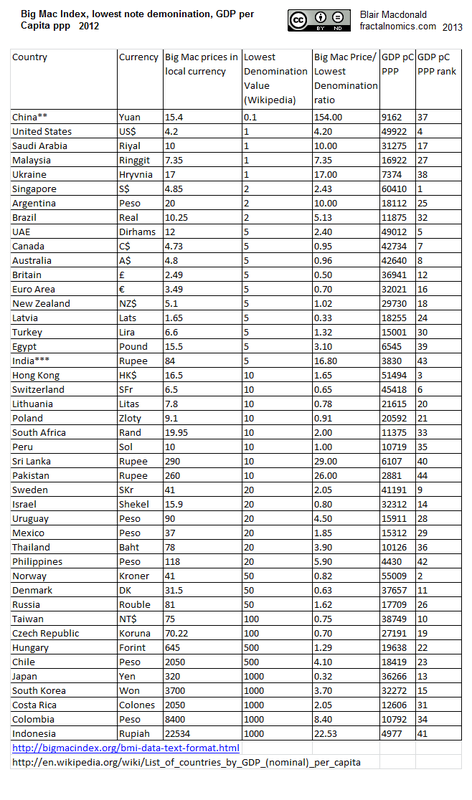 But here the inflation has been rather slow compared to the the countries with hyper inflation. I wonder if in Zimbabwe dollar note size bought the same (amount) of good through there time of hyper inflation?